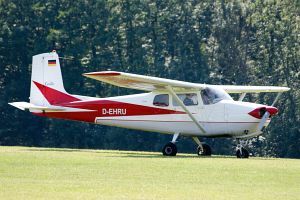 The Cessna 175 Skylark is a single-engine four-seat light touring aircraft produced by the US-American manufacturer Cessna Aircraft Company. The Cessna 175 is a development of the Cessna 172 powered by a geared variant of the same Continental GO-300 engine. It was marketed as the 175, the name Skylark was used for the deluxe versions only.